Businesses and GIS users around the world are embracing commercial GIS software. Because sometimes it just makes more business sense to choose a commercial GIS software package. Customers prefer 24/7 business-class support – and someone to yell at when it’s not working properly. The software and GIS file formats have become the de facto standard in the industry. Less training is required because universities select it for teaching. We’ve already mapped out open source GIS software. But what are the commercial mapping software products being used in the GIS industry? From A to Z, we explore commercial GIS software. Esri busted onto the geospatial scene in the 1970s. They’ve pulled ahead as being the market leader in commercial GIS software and hasn’t looked back since. The fine-tuned Esri ArcGIS is the most innovative, cutting-edge GIS software in the industry. When you look at the amazing features in the whole ArcGIS suite, it begins to make sense why they are so good at what they do. 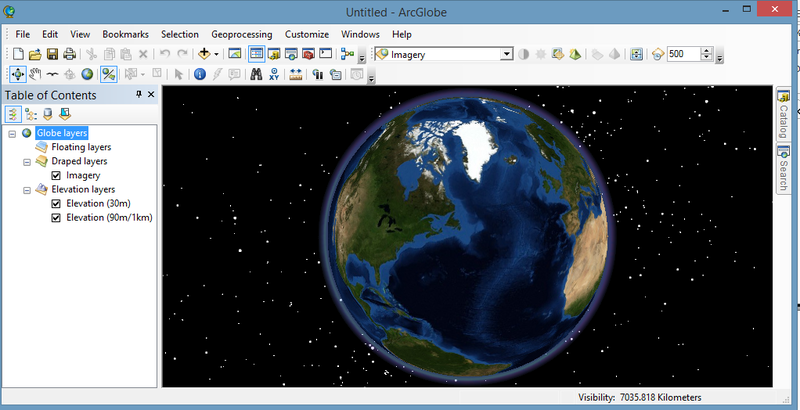 ArcGlobe and ArcScene bring objects to life in a separate 3D interface. Furthermore, ArcEarth has an interface similar to Google Earth that is part of the Esri family of software. Standard mapping is top-notch in ArcMap. They’ve perfected automatic map production with data-driven pages, ultimately saving you time and money. The extensions are amazing. Network analyst is one of a kind, and nothing comes close from other commercial GIS software. ArcGIS simplifies geostatistics by actually teaching you statistics giving the user more informed decisions. Scripting and model builder deserves all the rave it gets. Stringing together models is an easy process after a bit of practice. Esri GIS software provides scalability, interoperability, stability, flexibility with their cartographic, modelling and spatial features. There are so many reasons why Esri should be the choice for your organization. Geomedia has been the main rival to ArcGIS for years, even decades. Previously owned by Intergraph, now Hexagon Geospatial Geomedia has a 40 year history in the GIS industry. Government, infrastructure and military groups are embracing Geomedia because of its solution-driven approach. 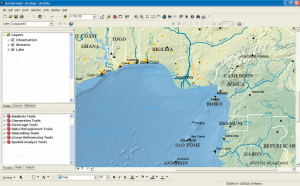 Geomedia is a comprehensive commercial GIS software package because how it provides advanced data management, visualization, analysis and cartographic tools. It’s a powerful and flexible solution to extract actionable information. The quickness of Geomedia 3D displaying three-dimensional models will startle you. The rendering is accurate, powerful and beautiful. Geomedia 3D delivers. It has smart data capture and validation tools because data integrity is important to all organizations. Geomedia has cadastral data management that ensures completeness and robust commands. For example, it has tools for conflation (selectively combine data with conflation rules to increase the overall quality), 3D point cloud (such as LiDAR) and mobile capabilities with MapWorks. But this is just scratching the surface of tools and options available. 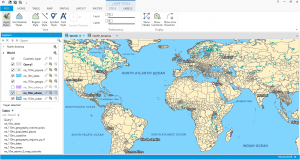 MapInfo Professional has come a long way in terms of proprietary GIS software. It has a clear focus on location intelligence. Locate optimal positions for retail stores, uncover geographic patterns and improve insurance risk with GIS insurance mapping. Usability means productivity – This is a core philosophy for MapInfo. It comes naturally as naturally to you as breathing. Ultimately, this helps drive greater profits. The latest version brings improvements in cartographic output. It’s smarter with labeling, legend and scale bars. It brings 64-bit compatibility, enhanced layouts and much more. It’s a full-blown GIS software package always mapping out new ways to innovate. Global Mapper was originally developed by the USGS. It has evolved into a GIS commercial software product competing with the GIS industry giants. If there was a ’Swiss-army knife’ for GIS software, Global Mapper would be it. This commercial GIS software is flexible enough to satisfy both the beginner and advanced GIS user. Its core applications reach back to its roots of working with elevation data. These specialized tools include 3D rendering, watershed delineation and LiDAR handling. 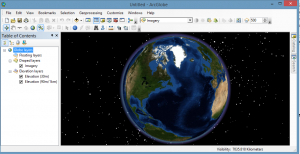 Global Mapper offers decent interoperability, map publishing tools in a flexible map viewer interface. It reads a large number of geospatial formats. Print layouts and symbolization variety are some of the only complaints of Global Mapper. Overall, it’s an affordable commercial GIS software – at a fraction of the cost of other GIS proprietary software. How awesome would it be to get all the features in a full-blown GIS package but pay half the price? Manifold GIS is all about delivering world-class GIS commercial software. You can pick it up quickly. It’s intuitive interface enables GIS users to seamlessly work endlessly in a 64-bit GIS environment. Manifold GIS is a combination of mapping, CAD, DBMS and image processing. It’s stable with a wide range of functions. Although limited on cartography options, you can still deliver some spectacular map products. The 3D bar charts in Manifold GIS are drool-worthy. GIS bargain hunters like its unbeatable price/value ratio. Manifold GIS may be the only GIS software you need. GE Smallworld makes all the difference for tech-savvy GIS users working in utilities. This GIS commercial software lets you better manage, design and plan any type of network infrastructure with its centerpiece Smallworld Core. Smallworld Core gives you the capability to capture and visualize complex spatial networks. It provides the foundation to manage the life-cycle of network assets. From network planning, design, build, operations and maintenance, SmallWorld holds your hand every step of the way. This commercial GIS software is highly expandable and is widely used by electrical, telecommunication, gas, water utilities. Outside this realm, you may want to look elsewhere. Some of its key strengths are its versioning, available architecture and expandability. We step into a world of CAD and GIS fusion. In the Bentley world, their 2D and 3D viewing provides a foundation for top-notch visualization. Fly-throughs in Bentley Map are a heaven-sent opportunity. Shadow studies, 3D intersects and clash detection come with ease with Bentley’s 3D tools. With Bentley Map, you can access, share, edit and analyze CAD, BIM and GIS data. It advances GIS for infrastructure from basic mapping to tracking infrastructure life-cycle. You can do away with the divider from GIS and engineering through Bentley Map. Connect to other GIS proprietary software formats such as Esri file geodatabases, MapInfo and other CAD engineering company formats. It’s an optimal choice for organizations heavy on the CAD end looking to expand into GIS. Meet the Golden Software family of GIS commercial software for your geospatial needs. Surfer is a powerful contouring, gridding and surface making package. Its versatility lets you create some unique maps in XYZ directions. There’s a short learning curve for this commercial GIS software. The heart of Surfer is visualizing 3D data. Surfer delivers a total of 11 map type options including wireframe, 3D surface maps and vector-scale maps. MapViewer lets you publish and share professional maps. This includes pin, contour, symbol, density, hatch, prism, territory and line graph maps. Geocoding is available in MapViewer. But it’s not a forte. …but with the Golden Software family it doesn’t have to be. Map with confidence using Maptitude. You can produce quick and beautiful maps… and tell the story that your spreadsheets can’t. Maptitude is a way to find geographic patterns and trends with the vast amounts of spatial data you work with. Hidden in the numbers, Maptitude unlocks how geography can affect businesses. Although less on GIS processing tools, it has some tools to get the job done like determining drive-time and identifying hot spots. Maptitude has some neat mapping outputs like 3D prism maps, scaled-symbol and bar chart maps. It comes packed with population, household, employment demographics and education data. It’s easy to get into and fun to chart out your geographic data with Maptitude. The look and feel of SuperGIS eerily looks similar to ArcGIS… The data/layout view, the on-the-fly coordinate systems, the extension options… it had to be said. With that said, I thought SuperGIS was fast at processing geospatial data. It buffered, clipped and merged faster than some of the other commercial GIS software giants on this list. … And when you’re on the clock working in the GIS industry, time is a precious resource. Tools outclocked ArcGIS at times. SuperGIS has some unique features like the biodiversity analysis. There are analyses for patches and biodiversity classes on the landscape. It’s always fascinating seeing the 3D viewers available. SuperGIS 3D Earth Server enables GIS users to get a bird’s-eye view of a city or even manage underground utilities. SuperGIS is a cheap alternative. It’s fast. And it has a whole boatload of GIS functionality. Clark Laboratories IDRISI more specializes in remote sensing than anything else. It has a strong foothold in remote sensing and commercial GIS software. It’s used in colleges and universities from the get-go. IDRISI boasts a 300-set of GIS processing tools. Although primarily oriented towards raster processing, IDRISI has adapted into a commercial GIS software suite. What’s really neat about IDRISI is the add-ons. The Land Change Modeler add-on models trends on the landscape for decision support. The Habitat and Biodiversity Modeler shows patterns for habitat assessment. There are add-ons for climate change, ecosystem and Earth trends. This goes to show how IDRISI software is the perfect choice for remote sensing, GIS and environmental applications. AutoCAD isn’t just about drafting. AutoCAD Map 3D bridges the gap between CAD and GIS. For those already using Autodesk, this commercial GIS software gives a familiar interface to manage spatial data and underlying asset information. With its growing range of tools to choose from, you can also produce some beautiful cartographic output. As the name suggests, AutoCAD Map 3D seamlessly renders spatial data in three dimensions. Whether you’re working in oil and gas, public utilities or the mining industry, 3D mapping is an advantageous feature. …And AutoCAD certainly delivers in that respect and much more. TatukGIS comes packaged as different versions. The slimmed down TatukGIS Viewer is completely free for everyone to use. Their commercial GIS software TatukGIS Editor gives a great deal more features including scripting/customization, 3D mapping and advanced data editing. With state-of-the-art editing functionality, one of the bright spots for TatukGIS is the topology and error-checking tools. It has on-the-fly projections with support of over 900 datums. It supports most database engine for a wide open choice for enterprise-level data storage. The name TatukGIS comes from Tatuk Lake in British Columbia, Canada. And this is a brand you should remember for proprietary GIS software. TNTmips, TNTedit, TNTview and TNTscript is the MicroImages commercial GIS software family. TNTview is the bare bones version from MicroImages. But there’s nothing bare about it. It comes with some fairly advanced options like stereo and 3D viewing. TNTview can be used for map design and thematic cartography. One cut above is TNTeditor. Take all the features from TNTview and add data editing. Create, georeference and edit imagery with this powerful GIS commercial software. TNTmips is the complete proprietary GIS software solution. It has LiDAR support, terrain analysis, web map publishing and a load more of useful GIS tools. Finally, TNTscript lets you string together sets of GIS processing tools. Process GIS data locally or through cloud computing resources. This gives automation a new level to complete your work flow. We tested the software and realized instantly – the goal of MapMaker Pro is for anyone to be able to create a map with ease. It’s a low-cost solution for those who need to put spatial data on a map. It accepts the most common GIS formats. There are capabilities to manipulate 3D, GPS, vector and raster data. With this commercial GIS software, you don’t get a whole ton of options to manipulate and analyze GIS data. But for this looking for a quick and cheap solution to mapping out data, MapMaker Pro might be the answer you’re looking for. 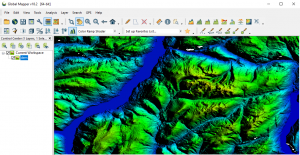 XMap is a user-friendly, low-cost, all-in-one GIS software. But it’s mostly for simplifying data collection. XMap bridges the gap between data collection and field staff. For example, users can create forms to easily collect data in the field. Other key points is that XMap Professional is a GIS data viewing application. It can be fully integrated in an Esri environment. XMap GIS Editor offers tools to import, create, query and edit data for small-scale GIS operations. Although primarily used for field activities, XMap is a commercial GIS software option to also edit, manage and visualize geospatial data. Conflationers need to take a look at MapRite from Envita. Envita MapRite is a market leader in conflation and data cleansing. It seamlessly corrects location errors with a bit of user guidance. It boasts some powerful clientele. Customers like Land Registry, Scottish Power and Network Rail are using MapRite because of its ability to maintain accurate records. It has an automatic service for managing map change and reporting features. With superior annotation handling and a bunch of other features, MapRite puts the power of GIS in the hands of the user. Your choice of GIS software is critical. If you don’t make this decision right, it can make or break your business. That’s why we’ve put together a GIS commercial list with what’s available in the industry. You get the complete picture of commercial GIS software. 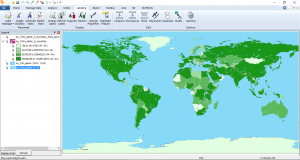 Where do your GIS needs meet the desired GIS software functionality? At this point of intersection is where, you as a GIS professional, should decide. Your GIS Workstation – What to Upgrade? The rise of Qgis and other open source GIS implementations could leave commercial GIS platforms fighting for survival in the near future. For most basic GIS tasks Qgis and a graphics editor like adobe illustrator are sufficient. This way immense licensing fees can be avoided. Why is Cadcorp GIS missing off this list? Supports 160+ spatial formats including databases, very interoperable and has a free version (Map Express on the website). There is no such thing as “commercial” software, it is only a misnomer. You mean to say “proprietary” software. And your forgot to mention hundreds of businesses supporting Open Source software packages professionally, including SLA and all you desire to yell at somebody. Please update this post or better even scratch it altogether. It’s unbelievable that Cadcorp isn’t on there. It’s worth taking a look at what they do. It’s used all over.